Iridian’s new capabilities leverage our leading-edge technology to meet and exceed expectations for reliability and optical performance using our proven hard-dielectric coating technology. Iridian’s MZF meet durability and reliability requirements for space use (standard MIL specs) as well as customer defined requirements. Our multi-zone filter assembly approach addresses needs in multi-spectral imaging applications requiring many bands, complex filter coatings, or with constraints on cost. In this approach coatings are deposited on separate substrates that are subsequently attached together using robust assembly methods. 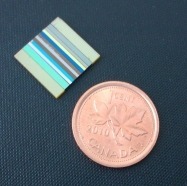 These assemblies can achieve zone-to-zone transitions of < 100 μm and have been manufactured with as many as ten different spectral bands, turning single detectors into multi-spectral imaging devices. The image above shows a MZF with ten bandpass filters between 3um and 13 um developed under a subcontract from ABB Canada for the Space Technology Development Program of the Canadian Space Agency. For applications requiring a small transition zone or patterns not possible to achieve by assembly, Iridian’s patterned multi-zone filters are the perfect choice. Iridian’s in-house photo-lithography lab is housed a Class 1000 clean room capable of patterning up to 150 mm diameter wafers. Multi-step patterning can be peformed creating MZF’s with as many as five different zones and zone-to-zone transitions of as little as 20 μm. Patterned MZF’s can include black coating transitions zones to isolate the separate spectral bands, reducing the potential for cross-talk at the detector.